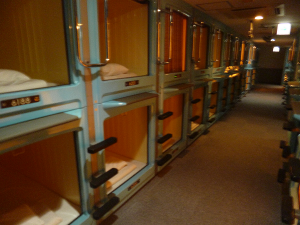 Although it resembles a crematorium, it’s really what can be called a “cramatorium”—a capsule hotel featuring the kind of coffin-sized single-occupancy unit into which I had to cram myself and my writing for about $25 per night during the Tokyo leg of my current extended Asia road trip. A beehive of shuffling slippered blue-robed all-male traffic to and from the units to the showers, the sinks, the lounge and lockers, the endless rows and banks of capsules on my floor nonetheless resembled a morgue, especially after midnight, when most of the crammees were out for the night, in one sense or the other. —Don’t expect to be able to work during the day. The hotel I stayed at has a strict policy that requires all guests to check out at 10 AM and to stay out until 4 PM, which is almost a full work day. Being forced out of your hotel for six prime work hours per day seems at best peculiar, even though it stimulates sightseeing and day-trip spending. Compounding that annoyance is the forced daily change of sleeping unit, clothes locker and shoe locker, with a corresponding change in all keys on top of mandatory re-registration and signing of forms. Reminded me of musical chairs. Make that “musical coffins”. —There is no guarantee of reliable wi-fi Internet service. 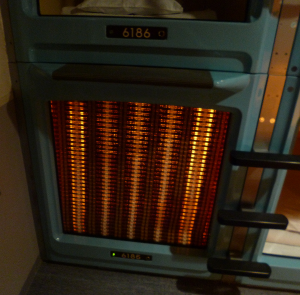 Incredibly, Internet service in Tokyo is not reliable—at least not from the capsule hotel or the “free spot” at the glitzier hotel next door, which was more like “free spotty”. In the three days I tried to write and upload articles from the lounge (described as the best wifi location, I was constantly stymied or sabotaged by failed connections, including a very ill-timed disconnect that cost me some edits and a lot of time. — The environment can be quiet when breathing is shallow. Yes, if no co-casket consignees near you sneezes, coughs, vigorously rolls over, endlessly unzips and rezips bags or, worst of all, crumples or digs into a plastic bag for the last fugitive potato chip. Such artificial, man-made noises, which of course are ubiquitous in communal accommodation such as hostels and capsule hotels, are especially distracting because of a critical ambiguity: They are inhuman sounds with a human source—a paradoxical combination that really grates on many of us, because our primitive brain—the reptilian, avian or whatever portion of it that responds to sudden sounds—doesn’t quite know what to make of it and responds twice as vigilantly as it would to an unpuzzling identifiable animal or natural sound, such as the wind. Existentially speaking, there is something alien and inhuman in a human-source non-human noise. It is simultaneously willful, yet mechanical, which makes resentment both predictable and in some sense unjustifiable, as our existentialist impulse to ascribe responsibility gets thwarted by the mechanicalness of rattling coat hangers, rustling clothes bags or potato chip bags (forbidden along with any other foods or drinks) within the capsule. —There will be unwanted distractions from work. 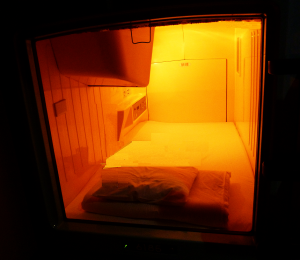 Working from within a capsule (which, it turned out and contrary to the claims of management) the best, not the worst place for Wi-Fi connectivity, is the unit, not the lounge, and therefore work is subject to distraction by passing heads or feet, depending on whether your unit is floor or eye level. These can be literally screened out (as shown in the lead photo of my unit), but at the cost of precious oxygen, which is pumped only centrally, not into individual units. Unexpectedly, I was rescued from the cramatorium by a Tokyo friend, who, from pity or payback, secretly booked me into much more posh hotels as an unsuspecting guest—in part as her thank-you for past, comparable hospitality on my part, as a Canadian host, during her visits to Canada. —Tattoos are not welcome. If you are a tattooed telecommuter, keep them covered, especially if you are Japanese. To keep “yakuza” gangsters out, management has posted a vaguely worded sign that specifies that admission will be denied to anyone with a tattoo. However, a staff member explained that to avoid trouble, no direct, explicit reference to the yakuza is made in the notice or elsewhere and that as a non-Japanese you probably will have no problem, unless, of course, you otherwise look like a thug. …so long as they don’t try to fit anything or anyone that’s too big into the small lockers provided.